I get that this story is sweet and full of geeky goodness but I just didn’t connect with the characters or story at all. 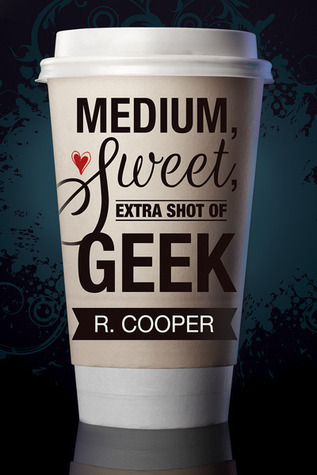 Medium, Sweet, Extra Shot of Geek is a cute story about a barista and a geek, who both happen to be war veterans – so there’s some subtle subtext about connection and understanding. Yes, Tavio is reticent and ominous, and Tommy clearly knows how to read Tavio’s behaviour and almost non-existant mannerisms but I failed to see what more Tommy saw in Tavio. *shrugs* I guess I don’t need to know, but I still felt like I was watching the duo through a window rather than feeling immersed in the story. There’s a noteworthy twist on family structure which was a pleasant change. The interactions between the two MCs were candid and thoughtful – and yet, I was underwhelmed. 66 pages of storyline with quite a few details that were thoughtful and held so much promise or possibility, but yet it was just not enough for me. This entry was posted on June 10, 2014 by BioB in Contemporary, Reviewer: Sue and tagged 3 Stars, dreamspinner, r cooper.